Nordic Dino is a professional supplier of a comprehensive range Aviation Services and products, mainly focusing on the aircraft exterior washing system Nordic Dino. 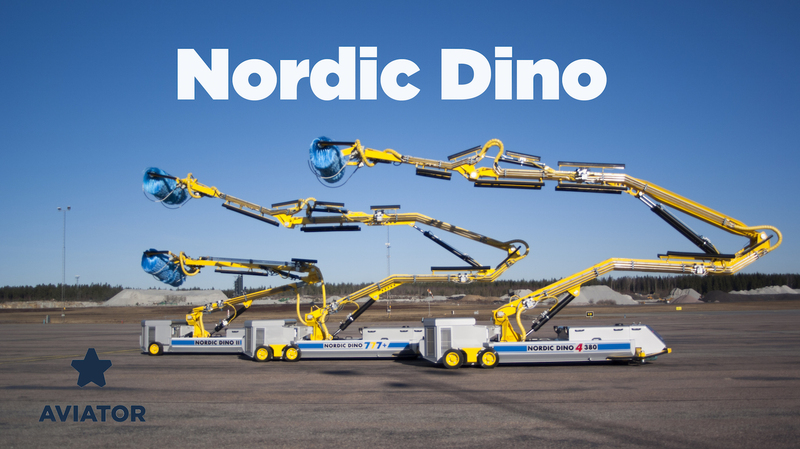 Our Nordic Dino serves airlines and ground handlers world-wide. NORDIC DINO the washing robot, a computerised and self-contained system purpose built for washing aircraft exteriors. The system consists of a mobile power unit, spray nozzles and rotating cleaning brushes powered by a lightweight remote control that permits safe and simple one-man operation. NORDIC DINO meets the requirements for washing aircraft exteriors and incorporates safety features designed to prevent accidental personal injury and aircraft damage. NORDIC DINO is a reliable, economical and safe way to keep your aircraft fleet clean, and has been boosting the image of both commercial airlines and military customers and reducing their fuel consumption and environmental impact since 1983.